I frequently complain about beer distribution here in the heartland. 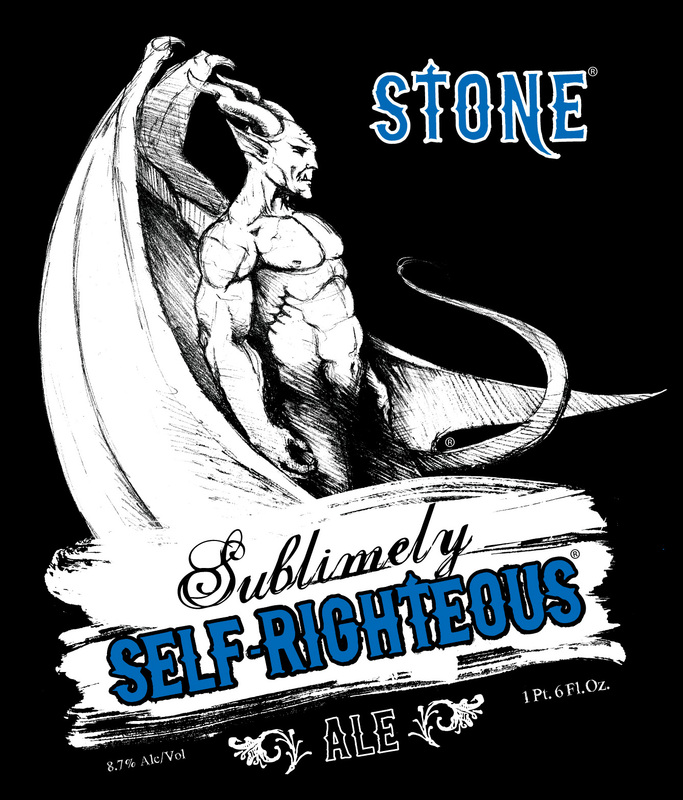 Well, I have one less brewery to complain about now, as Stone will begin distributing in Missouri next month. Yeah, I’ll still have to drive 45 minutes to get some, but better than nothing (and the silver lining of having to make a trip to the airport). One style I have little access to here in the Free State is the American black ale/Cascadian dark ale/Black IPA/what-ever-you-want-to-call-it. Last week I was in the beer wasteland of AZ for a wedding. I stopped at Whole Foods and picked up a couple bottles to bring back, including Stone’s Sublimely Self-righteous ale. With thirteen syllables, it has to be good right? Perhaps one of the stupidest names yet coined by the fine people at Stone. Stone created this beer as their 11th Anniversary offering, and quickly added it to the year-round line. It has become one of the most well regarded and widely available brews in this fledgling style. After one sip, I can understand why. NOTES: 22 oz. Bomber with the miss at the Hordeum ranch, poured into a pair of snifters. Typical cute Stone labeling job showcases excellent use of a thesaurus. APPEARANCE: Pours a dark brown. Looks almost black in the glass, with a touch of mahogany around the rim. LACING: Head disappears leaving a ring around the glass and some pools. NOSE: Floral hops, also some earthy, roasty, almost smoky notes. The miss says it smells like plastic, but she has a cold, so disregard her input for the moment. TASTE: Great mix of flavors. Very hoppy but extremely well balanced. Hops hit first, then give way to a bit of roasted malt sweetness. Mouth-watering grapefruit bitterness kicks in, and the finish is medium-dry. MOUTHFEEL: Very creamy texture with silky-smooth carbonation. Full bodied (like a good, robust porter) but very smooth. DRINKABILITY: Another, please. 8.7%? I could session this. And I would, if I had another bottle. RATING: This is a very, very good beer. I will give 3.5 hops, and the only reason I won’t give four is because I haven’t had enough of this style for comparison to give it a top score. The Aleheads like to stick it to Stone because their marketing asks for it, but I have to admit, they deserve to be proud of this one. Great, now I’ll have to grab a bottle and give Stone another chance. You know how I feel about second chances. I’ve got a bottle of this in my fridge. Not a style I’m particularly familiar with or thrilled with, for that matter, but I believe I’m acquiring a taste.